I didn’t go to ConCarolinas in 2015 with the idea of meeting Michael Hogan, the actor who portrayed Colonel Tigh in the reimagined Battlestar Galactica series. At one time I thought BSG was a candidate for the title of Greatest Sci-Fi TV Show Ever. I’m not sure I’d want to hand that trophy out, but I like to grant nominations. Sadly, BSG let me down in the final season. I think maybe the show had been pushed so far to the back of my mind that I just skimmed over Hogan’s guest announcement. I was more interested in seeing Joel Hodgson, creator of MST3K. He was really awesome and I will blog about him later. Before I left town to travel to the con, I went shopping for a t-shirt appropriate to the occasion. I found a NASA shirt which I thought would be cool, but surely there would be tons of people wearing it there. As it turns out, I was the only one, as far as I could tell. It paid off, because I entered the room scheduled for Hodgson early, and you can probably guess whose talk I interrupted with a door that managed to slam itself loudly. Why do all con doors do that? “Speaking of NASA,” segued Hogan, who proceeded to discuss real astronauts who were fans of BSG. Woah. Did Colonel Tigh just alter his discussion because of me? Dang it, this is what I get for being someplace early for a change. His talk was great, what little I got to hear of it. On my way out, I was still thinking about my entrance and whether it all went down the way I thought it did. Browsing the vendor room, I had a good view of Hogan standing out in front of his signing table. He was roping in passersby for chats and discussions. I could tell he was very personable. Finally, I worked up the nerve to go speak to him. I must have imagined my involvement in his talk, filling in the gaps with what I wanted to hear. Nope. He immediately commented on my shirt. I can’t remember if I apologized or what. I do remember having a delightful conversation with the man. Holy frack, I was talking to Colonel Tigh. It was just then I realized something I had forgotten, or never really considered: Saul Tigh was my favorite character on Battlestar Galactica. I had to tell him. I explained why. I think it made sense. Another guy stopped by to enter the conversation. Hogan spoke his favorite line from the show. This was really happening. I don’t recall too clearly the order of events, but at some point we got to talking about real space exploration. He wanted to give me a non-fiction book recommendation. He tore a piece of scratch paper and wrote on it. I had a space book recommendation from Colonel Tigh. I had his actual handwriting on paper. When I picked up a business card from the table for his booking agent, he offered to write his name on the back. “You know how it is at these conventions, you get home with cards and you have no idea what they’re for,” he said, or something to that effect. I now had his handwritten name and I hadn’t even paid for a signed picture or anything. Well, his signature probably looked different. But this was better. Best of all, I seized the opportunity that confronted me. I reciprocated, giving him my business card, all shiny and new. On the flip side was the cover of my first book, Salvaging the Beast, released on the Kindle that very day. I gave my business card promoting my first science fiction book to Colonel Tigh! I’m still not sure that this has actually sunk in. 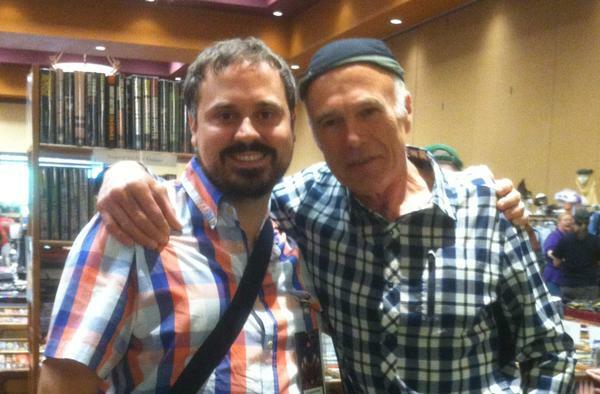 The next day I decided I wanted to get a picture with Michael Hogan. My business card was still on his table. That means he didn’t throw it away. Yay. I’ve decided to go back and watch Battlestar Galactica again. When I reach that line from Colonel Tigh, I know I will smile.